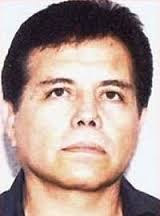 Quintero 'Cadete' Navidad Major Mexican drug cartel leader Quintero Navidad admitted in San Diego federal court that he organized the transportation and distribution of large quantities of cocaine and heroin into the United States. Sajid Emilio Quintero Navidad, aka Cadete, pleaded guilty to all charges ... conspiracy to distribute controlled substances intended for importation, conspiracy to import controlled substances and conspiracy to launder. 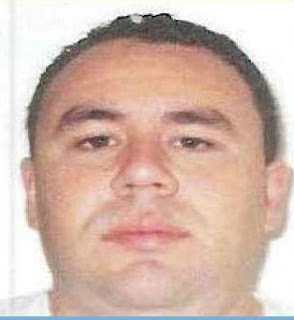 Quintero Navidad, 36, is the cousin of fugitive Mexican drug lord Rafael Caro Quintero and an associate of high-ranking Mexican cartel leader Ismael Zambada-Garcia, aka Mayo. 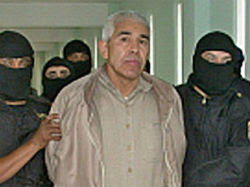 Quintero Navidad is believed to be one of the highest-ranking Mexican cartel leaders in the US. 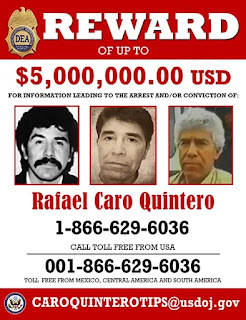 Rafael Caro Quintero Quintero Navidad’s guilty plea sends a clear message to other drug kingpins operating in Mexico said U.S. Attorney Adam Braverman. "There is no place to hide because our federal team will work tirelessly to hunt you down to face justice in our courts”.